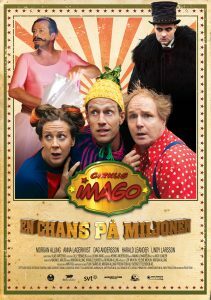 The TV series Cirkus Imago, with Morgan Alling, Anna Lagerkvist, Harald Leander and Dag Andersson in the supporting roles, has pleased Swedish television viewers for two seasons. The first season had its premiere in 2009 on Svt, Barnkanalen. The second season appeared two years later. In 2015, One in a Million, a feature film based on the series had its premiere in 2016.